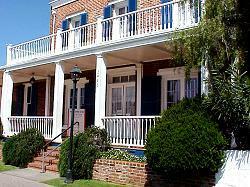 San Diego's Whaley House is listed by the United States Department of Commerce as an authentic haunted house. 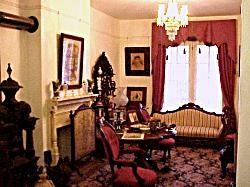 Built on the site of early San Diego's public gallows, and scene of numerous deaths and angry confrontations, the Whaley House is home to several ghosts and unexplained phenomena. 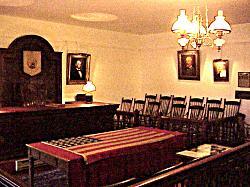 In 1869 the city leased this room as a courthouse. As the population grew in San Diego's "New Town" the city fathers wanted to also move the public records out of Old Town. A heavy iron chain in the room has been seen to swing on its own, and many people report feeling uneasy there. Heavy footsteps have long been heard upstairs, above this room. In 1871, with Thomas Whaley out of town, an angry mob held wife Anna Whaley at gunpoint on the 9th step of these stairs while the records were removed. Visitors to the house report feeling a chill in the air as they step there. 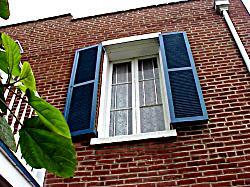 The ghost of Thomas Whaley has been seen on that second floor landing, dressed in a black frock coat and wide-brimmed hat. The archway between the parlor and music room is located when Yankee Jim Robinson was hung in 1852, before the house was built. People report feeling a constriction in the throat when standing there. 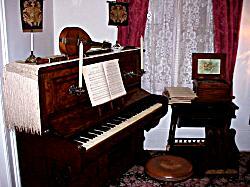 From the music room can be head songs from the turn on the century, and laughter. The smell of a cigar and the fragrance of perfume which quickly vanished have been reported. In the music room is a lamp that must be a favorite of one of the ghosts. Often, one or two of the crystals have been seen swinging, while all the others have remained motionless. 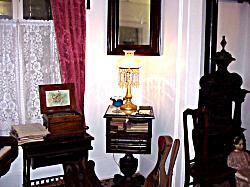 Electric lights in the house have been seen to flicker, go on and off by themselves. Electrical inspections have found nothing to explain this. Sometimes at night a figure can be seen in the upstairs windows, long after everyone has left the building for the day. The ground floor windows have been sealed shut to keep them from opening by themselves late at night, setting off the alarm system. 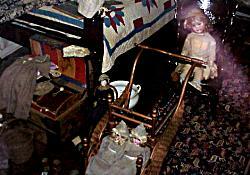 Little Thomas Whaley was the first to die in the house at the age of only 17 months, in his upstairs bedroom. The cries of a baby have been reported coming from this room. 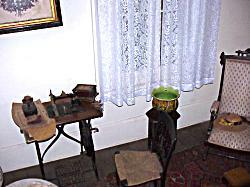 The ghost of a small dog has been seem coming and going from this room, as well as being seen outside the house, in the yard. 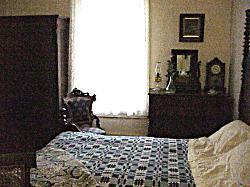 Curtains in the bedrooms have often been reported to billow and move, even though the windows are sealed shut. Beds and pillows have shown the impressions of someone having laid there, even though glass panels in the doorways make it impossible for visitors to actually enter the rooms. Curtains in many rooms seem to move by themselves. 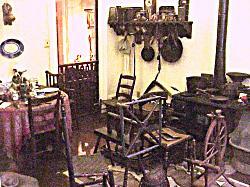 The rocking chair in one upstairs bedroom has been seen to rock on its own. 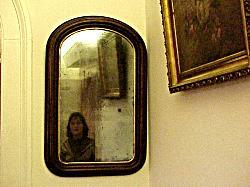 There are several mirrors in the house. At sometime or another, someone has reported seeing a face or partial figure in everyone of them.